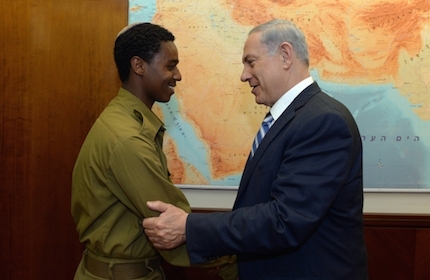 On Monday, Netanyahu met with Damas Pakada, whose beating last week was captured on videotape. The attack spurred violent demonstrations in Jerusalem and Tel Aviv. Netanyahu told Pakada that he was shocked by the beating and said it cannot be accepted. Police Insp.-Gen. Yohanan Danino apologized to Pakada on behalf of the Israel Police and informed him that the officer who beat him was fired immediately. Also Monday, President Reuven Rivlin said Israeli society has “erred” when it comes to the plight of Ethiopian Jews in Israel. Addressing the demonstration Sunday night in Tel Aviv that injured more than 40 police and demonstrators, Rivlin made his remarks prior to a meeting with the heads of haredi Orthodox municipalities and local councils. “Among the protesters on the streets were some of our finest sons and daughters: outstanding students, those who served in the IDF. We owe them answers,” Rivlin said. Jewish Agency Chairman Natan Sharansky in a statement called on all Israelis to “listen carefully, help foster a more constructive discourse, and mobilize to improve the situation in a real and tangible way.” He called on protesters “to exercise good judgment and moderation, to respect the law and public order, and to utilize the societal conversation that has been started” to achieve their goals.